I’m trying desperately to enjoy last year’s television series Houdini & Doyle (2016). Houdini & Doyle crosses Victorian mystery with the X-Files, when Houdini (a skeptic) and Doyle (a spiritualist) set out to solve seemingly supernatural crimes. Adelaide Stratton, the first female constable of Scotland Yard, accompanies the duo on their adventures. The show has some historical truth: Harry Houdini and Sir Arthur Conan Doyle were, in fact friends and contemporaries. The two were fans of each other’s work and met in London in 1920 during one of Houdini’s European tours. Houdini was a skeptic (but with far more nuance than the show portrays–he had a collection of books on spiritualism and later in life attended seances in disguise and gave lectures disproving mystics and mediums, eventually waging a war against the spiritualist community) and Doyle was a spiritualist. Adelaide Stratton (Rebecca Liddiard) did not exist. Or at least, not in 1901, when the show takes place (the first female constable did not appear on the scene until 1915). Adelaide has been hailed even by critics of the show as “the best part of the series.” I agree. She has the most to lose. Until assigned to assist Houdini and Doyle, Adelaide had been stuck in the basement filing and making coffee. Solving these cases, no matter whether the outcome proves scientific or supernatural, is not about proving either side of the equation correct, but about proving herself. She’s practical and professional. 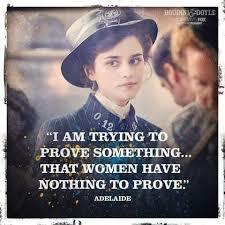 While Houdini and Doyle polarize themselves, Adelaide understands that the police work comes first. All egos aside. And she deals with a lot of egos, while traveling with these two celebrities. The earlier episodes ship Adelaide and Houdini, with Houdini as the big flirt (Houdini & Doyle wrote out Bess Houdini–Harry’s wife–a mistake I will never be ready to forgive). Adelaide will have none of Houdini’s flirting. She does her job with professionalism and an eye for the practical that keeps the story moving forwards. She reveals her past as she deems fit. Despite Houdini’s pestering her with questions, she reveals her past on her terms. She does not cave under pressure and is just as firm in her beliefs as both Houdini and Doyle. 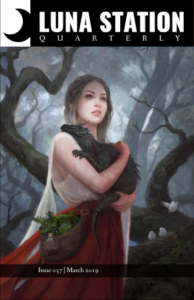 One of my favorite pieces of Liddiard’s portrayal of Adelaide is the way she consistently makes eye contact. Even if you are not a Houdini or Doyle fan, Adelaide is well worth watching this 10 episode series.